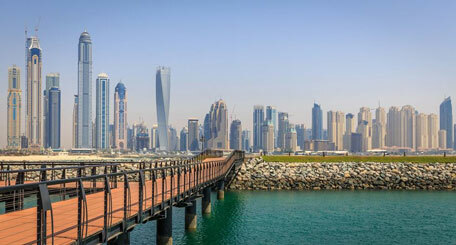 The process of purchasing property on the secondary market has become more streamlined in recent years, with various forms and procedures issued by the Dubai Land Department (DLD), as well as the introduction of Registration Trustee (RT) offices. While the overall process is the same, the steps that must be taken in a transaction depend on whether the buyer is purchasing with cash or a mortgage, and if the property has a mortgage against it. Once a buyer decides to purchase a property, the buyer and seller negotiate the terms and sign the property sales contract, also known as form F, which is required by the Dubai Land Department. Any additional terms and conditions should be attached in an addendum. Now, the buyer hands over a deposit cheque in the name of the seller. The current market practice is for the deposit to be 10 per cent of the purchase price. This deposit is to be held by the seller’s broker or a neutral third party, if no broker is involved. The cheque is returned to the buyer at transfer and is only cashed if the buyer defaults on the agreement. Next, a no-objection certificate (NOC) must be obtained from the developer. The NOC states that the seller has paid all service charges and other fees, and that the developer has no objection to the sale. The charge for an NOC ranges from Dh500-Dh5,000, and is usually paid by the seller. Most developers require that both seller and buyer attend the NOC application procedure. At that time, the seller settles any unpaid amounts, and the buyer may be required to arrange for future service charge payments. The buyer may also have to give the developer a deposit, which is refunded after the transfer takes place and the buyer presents a copy of the new title deed to the developer. Each developer has different NOC deposit and fee requirements, as well as processing times and validity periods, so these policies should be confirmed with the developer prior to applying for the NOC. The NOC generally takes five to seven working days to be issued. Once in hand, the parties are free to transfer ownership of the property. The DLD only conducts transfers if both parties to a transaction are GCC nationals; all other transactions must be done through a DLD-accredited RT office. Both parties or their legal representatives, through a valid power of attorney, must attend the transfer. *	the buyer’s portion of the transfer fee (4 per cent of the purchase price) as agreed between parties plus Dh580 in DLD registration charges. The buyer may also have to refund the seller for the prorated share of the services charges that were prepaid by the seller, however, this can be done through a personal cheque. When payments have been made and all documents are verified by the trustee, the information is sent through an online system to DLD for approval. Once approved, the trustee has the parties sign the official transfer documents. Finally, the original title deed is issued and given to the buyer, along with keys and access cards for the property. When there is an existing mortgage on the property, the loan must be settled prior to the transfer to the buyer. To do so, the seller must first request a liability letter from the lender (bank). This letter states the balance of the loan, as well as any fees and penalties. The liability letter generally has a validity period ranging from 7-15 days, depending on the bank. Therefore, it is important to time the request for the letter so that it does not expire prior to the transfer date, otherwise a new letter must be requested. If the seller does not have the funds to settle the mortgage, then the buyer must do it. Since a cash buyer needs protection against the seller transferring a property to another person, or changing the terms of the agreement after the buyer pays off the seller’s loan, it is important to “block” the property. Once the liability letter is received, the parties must go to the RT office to block it. After the property is blocked, the seller delivers the cheque to the lender, although some banks require the buyer to be present as well. After the mortgage is settled, the clearance letter and original title deed are provided to the seller. The NOC process then takes place. When received, the parties proceed to the RT office to transfer the property. The cheques are disbursed and the buyer takes the original title deed. If a buyer needs financing, a pre-approval letter should be obtained to determine the maximum amount the bank is willing to lend the buyer. The benefit of pre-approval is twofold: buyers and brokers can set a price range when searching for a property, and sellers will take the offer more seriously. To receive the pre-approval letter, salary certificates and bank statements are required by the lender. The pre-approval letter has an expiration date, so time is of the essence for the buyer to find a property and negotiate an agreement. Once the parties have signed the contract and the deposit is handed over, the lender will conduct a valuation or appraisal of the property’s value. The valuation fee generally ranges from Dh2,500 –Dh3,500 and is paid by the buyer. If the property is valued for at least the purchase price, the bank issues the final offer letter (FOL) to the buyer. The FOL includes all the terms and conditions of the loan and mortgage. The buyer arranges with the lender to sign the FOL and issues security cheques to the bank, as required. At transfer, the bank brings a cheque payable to the seller for the remaining balance of the purchase price. The mortgage is then registered with the DLD. If it is a conventional loan, the title deed is issued in the name of the buyer. If it is an Islamic (Sharia) loan, the lender is listed as the landlord and the buyer as tenant. In either type of mortgage, the original title deed is given to the bank to hold, until it is paid in full. Since there are two mortgages and perhaps two banks in this scenario, and all documents have varying processing times and expiration dates, the timing of requests for the liability letter, valuation, final offer letter and NOC is very important. After the buyer and seller sign the agreement, the buyer’s bank conducts the valuation of the property and the FOL is signed. Next, the seller requests a liability letter from the lender. Once the liability letter is issued, it is sent to the buyer’s bank, which settles the mortgage with the seller’s bank. After the mortgage is settled and the clearance letter and original title deed have been received, the parties apply for the NOC. When the NOC is ready, the buyer’s lender arranges the transfer. At the transfer, the seller’s existing mortgage is released. The fee for the release is Dh1,290, which is paid by the seller. The property transfer documents are signed. The buyer provides the cheques, as described previously, and the buyer’s lender issues a cheque to the seller for the remaining balance of the purchase price. The buyer’s mortgage is then registered and the buyer’s lender retains the original title deed until the mortgage is paid in full. Even with more efficient procedures in place, some of the steps need to be timed correctly, or the parties risk having to spend additional time and money. It is recommended that the services of a real estate company’s in-house conveyancing team, external conveyancing company or law firm be engaged to avoid such issues.